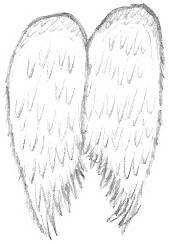 Drawings of angel wings requires just a little bit of patience and it's not a task I recommend for the trainee artist. The detail in the wings can be elaborate or you could settle for something fairly basic, the choice is yours. It really depends on how much time you can devote to the drawing. When I decided to get creative and design some wings, I thought about how I always imagine they look. We each have different ideas in this area so I can only call on my own imagination here. I started sketching and experimenting with all sorts of shapes first. Then I tried different ways on how to portray the feathers in the easiest fashion - to keep with the theme of simplicity. All of these sketches were done after just one year of practicing so don't be afraid to try copying these images, it's a way to discover what you can produce even though you doubt yourself. I used a mechanical pencil with a 2B lead and I kept my trusty kneaded eraser handy, too. 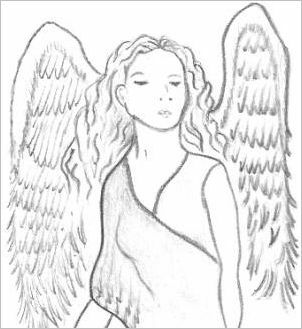 White wings are a distinctive angelic feature that helps us to quickly identify this spiritual guide. They protrude from the back and are covered in feathers, similar to birds, but the feathers are always white. Fairies have gossamer wings that are similar to a butterfly, so it is easy to distinguish the difference between fairies and angels. An angel is a messenger between God and humans. Some people have experienced encounters with them - that is so awesome. These beautiful heavenly beings are no threat to us. Sometimes we classify a helpful stranger as an earth angel. Click here to see more illustration or to learn more about this mysterious character. There is also more information available about fairies. 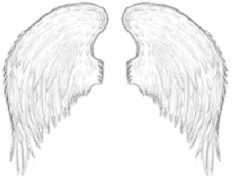 If you are looking for particular drawings of angel wings and you just can't find what you have in mind, that's a sign you need to record your original idea on paper! Lightly sketch in the design you want and if you're still not satisfied, re-do another beside that one. Keep going until eventually you come up with a great image recording your preconceived idea. You are welcome to use any of these images to help you design and complete your next sketch. Hey, don't keep reading, start doing!